Upon start up the client automatically makes a web services connection to a set of ESRI ArcWeb Services globe services. The web services are powered by ArcGIS Server 9.2. A new set of explorer services has been added to the Server core so that anyone (with ArcGIS Server) will be able to create and publish a service. It will also be possible to view ArcIMS and OGC WMS services. As you navigate around the globe, page views are streamed across the web to the desktop application for rendering. All the tasks (mini-applications) are server resident and are called from the client. 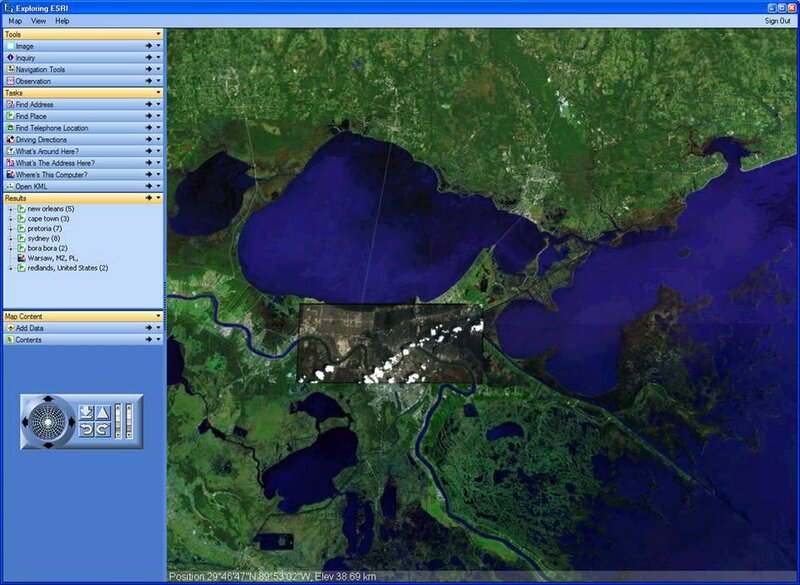 David posts a new screen-shot of ArcGIS Explorer (finally one with satellite imagery). How much quality will be put into these images is just a guess for most of us but since the screen shot is zoomed out so far, I guess it isn’t as good as Google Earth. I suspect it will be better than Public ArcWeb Services, but less than what one could buy via ArcWeb. Where that will put ESRI in relationship to Google Earth is anyone’s question. I’d suspect though that the greater choice of layers that will be available in ArcGIS Explorer coupled with the fact that you can easily connect to so many different geospatial servers could make ArcGIS Explorer a good competitor for Google Earth. What is clear though is that ESRI is looking at ArcGIS Explorer to drive sales of their server products and in the end this will probably result in ArcGIS Explorer complementing Google Earth, rather than replacing it. It all hinges upon if users can create WMS and other geospatial server links as quickly as Google Earth users jumped on KML. We’ll just have to wait for the beta and see how it goes.